A bright and modern apartment with superb view on the canal. 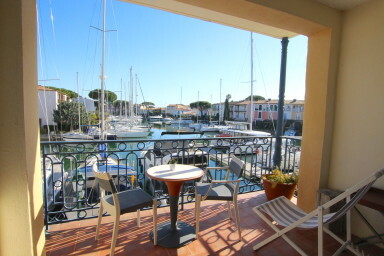 Lovely renovated 2-room apartment in Port Grimaud South. It is close to the shops and has a wonderful view on the canal. It is composed of a bright living-room with a well-furnished open kitchen, 1 bedroom that can be closed with a sliding door and a bathroom with toilets. On the canal side, a large balcony to accommodate 4 people for lunch (the table will be changed) who will enjoy sunrise. A cosy and modern apartment to enjoy peaceful holidays.